Whether or not you can believe it, fall is here! Now that temperatures are starting to drop at night you are probably looking for a way to heat your patio so that your outdoor fun and entertaining can continue. Here at Patio Products USA one of the most common questions we get is “How do I decide what’s going to work for my patio space?” The most important thing to consider when looking at patio products, particularly patio heaters, is how they will be used and where they will be used. Do you need something that is portable or are you okay with keeping the heater stationary? Do you have access to outlets, or do you require a gas or propane powered patio heater. How large of an area do you need to heat and how much heat output do you need? How often will you be using it? How important is operating cost? Are you trying to create a particular decorative aesthetic for your outdoor space? Once you’ve answered these questions take a look at the pros and cons of outdoor patio heaters, patio fire pits and chimineas to determine which device will best fit your needs. Outdoor patio heaters can run on electricity, propane, or natural gas. While some models of electric, propane, and natural gas heaters may look similar, they can vary greatly in their usage, features, and applications. Electric heaters use radiant heat, which warms objects and people, not the air around them. This means that electric heaters are very efficient and heat up quickly for frequent use. Because electric heaters do not run off burning gases or wood they do not have any emissions, which is better for the environment and also provides a pleasant experience for people and pets nearby. Propane patio heaters are self-contained and highly mobile, making them a popular choice for restaurants, cafes, and large home patios. An outdoor propane patio heater can come in the form of a large “umbrella-style” heater or small tabletop version for camping or tailgating. Natural gas heaters can be installed on large patios by running a gas connection. Popular with restaurants and cafes, these heaters have become increasing popular on large home patios to accent outdoor kitchens and achieve an upscale aesthetic. Fire pits and fire pit tables are more popular than ever because of the charming decorative element that they can add to an outdoor space. Fire pits provide a camp-fire look and feel that is just as good as the real thing. A gas fire pit may be even better than a real camp fire because you get all of the s’more roasting benefits of a real campfire without any of the hassle of wood gathering or cleanup! Whether you’re entertaining guests, relaxing with a glass of wine, or roasting marshmallows with the kids, an outdoor fire pit can provide great ambiance and bring the excitement of camping to your backyard year-round. 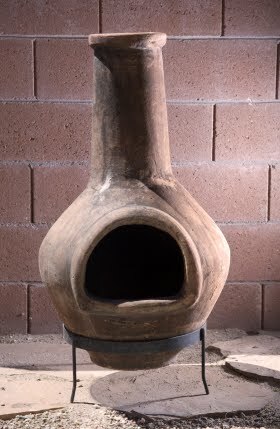 Originally from Mexico, chimineas have now made their way across the southwest United States and Central America. Chimineas are becoming more popular across North and South America, particularly on smaller patio spaces. Because of the way chimineas are shaped, the smoke output is released upward and the heat that they provide can only be felt on one side. This means that chimineas are ideally situated on the edge of a patio space so that smoke is released away and heat can be directed toward the center of the patio. Chimineas, however, unlike heaters or fire pits, have a tendency to require more maintenance. About the Author: Derrick Riley is a Managing Partner at Patio Products USA, a subsidiary of Neighbors Marketing specializing in patio products and accessories for the home and commercial use. Patio Products USA specializes in outdoor heating products, including a wide selection of authentic chimineas, outdoor fire pits and garden patio heaters. in all shapes and sizes. I have been on vacation for over 2 weeks, the blog is doing wonderfully since I've been gone. Great Job to everybody. Lovely just what I was searching for. Thanks to the author for taking his clock time on this one. I am perpetually thought about this, appreciate it for putting up. Electric space warmers work by straightforwardly warming a particular range as opposed to warming the air so they are awesome for centered warming, particularly in drafty territories.